The blessing of music was gifted to our third and fourth grade friends today as we enJOYed a special performance of Billy Goat’s Gruff given by the Ft. Worth Opera and Children’s Theatre program. Through the generous work between our six elementary campuses across the district in conjunction with FWO, our learners experienced a full opera at their level, many for the very first time! Studies show that repetitive positive experiences with arts education (music, art, dance, and more) not only encourages a lifelong relationship with the arts, but often opens the windows of curiosity leading to a new enthusiasm and discipline for learning in general. 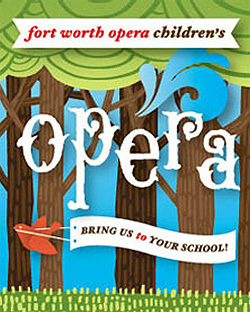 Since 1972, Fort Worth Opera has opened millions of young minds to the colorful and exciting world of opera. (See more at: http://www.fwopera.org). The operatic version of the Billy Goat’s Gruff story is based on scenes from operas by Mozart, Donizetti, and Rossini. An after-school game of hide and seek is ruined for three friends when a big bully blocks a bridge, and the two boy goats decide to go for help. The girl goat stays to confront the bully, but shows him kindness instead. By the end, she is able to introduce the ex-bully as their new friend. Billy Goats Gruff addresses the current issue of bullying, and teaches learners how compassion and understanding helps everyone get along. At this time of year especially, the blessing of music is glorious indeed and never more so than when performed for children to experience (some for the first time). As one child wrote (and shared with me) today, “I could close my eyes and let the beautiful singing move me through time to another place. Music makes my life so much better. Thanks for this special musical performance and singing today, Mrs. Van.” Here’s hoping the blessing of music, in any form you choose to participate, moves you during this festive holiday season. 🙂**Note: We have early dismissal on Thursday and Friday this week @ 12:45 p.m.